This butter knife is made of Japanese apricot. Japanese apricot has such features as the colour of burnished coppery and its sturdiness. This wood is often used for comb and beads. Applying Urushi lacquer and wiping off many times over brings out the wood grain and creates warm and deep impression. Since the handle takes on a soft and round shape, you will get a gentle feeling on your hand holding it. "Wakasa-nuri" is the specialty traditional crafts from Fukui prefecture. The feature of this pair of chopsticks is its design embedded seashell depicting the floor of the sea. Each piece has a long and complicated process coating many layers of lacquer. Comes with a gift box. "Tsugaru-nuri" is Aomori prefecture's one and only historic work of art. 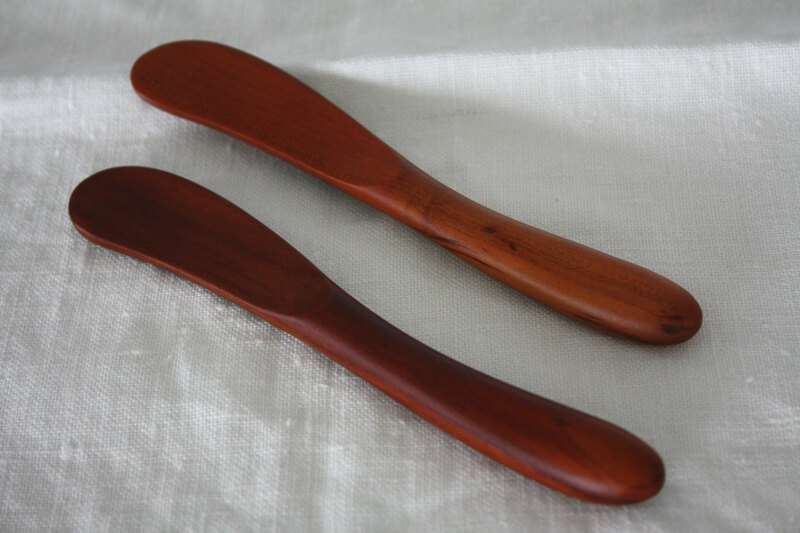 This pair of chopsticks is used "Kara-nuri" which is one of type of technique. This is a way in which speckles and checkers are drawn using a special slotted spatula, then painted on top of surface with a ground colour several times. After the application of the surface layers is completed, the pattern is brought out by sanding and polishing. Comes with a wooden gift box.